Kristin-Lee Moolman – We define what's next — inspired by Africa. South African photographer and filmmaker, Kristin-Lee Moolman, who’s created a new ‘African Mythology’ that has opened a whole new chapter of narratives, has shot for the likes of Vogue, L’Officiel and Nataal’s May 2018 debut print edition. 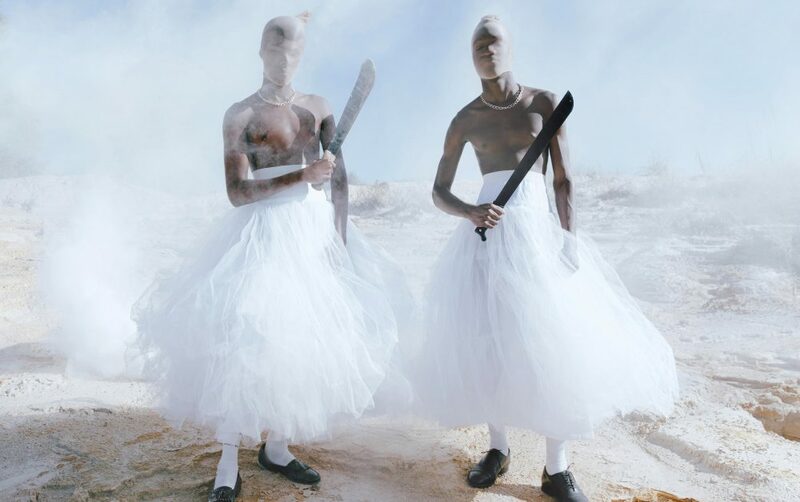 Moolman’s art aims to capture this idea of ‘New Africa’ – a place where the definitions of masculinity, femininity and segregation are reconstructed and given new meanings by shifting away from traditionality and conservative attitudes in her region. “I was born in a really backwards Afrikaans town before apartheid ended. I still have that experience of growing up in that and the complete wrenching shift of this new set of ideals”, she told Dazed Media. Her work juxtaposes a new gender ideology, by placing gender nonconforming subjects in front of ordinary, often suburban, landscapes and using a sun-bleached pastel aesthetic to further amplify the realm of surrealism. Most of Moolman’s photography has been created with fellow creative Sierra-Leone-born Londoner stylist, Ibrahim Kamara. Their most bespoke collaboration ‘2026, which was at view at London’s Somerset House in 2016, scrutinises the relationship between menswear and masculinity, sexuality and the black African body in 30 years. Their latest work ‘Soft Criminal’ in collaboration with designer Gareth Wrighton, at view at Red Hook Labs in Brooklyn, New York in September 2018. By using surrealism and fantasy, this exhibition sheds light on interrelated narratives of characters from the African diaspora through an alternate universe.